Apples – No heartburn, no reflux, FIBER! I’m eating 2 at a time these days. Pinatas are harder to find downstate, so falling back on Honeycrisps when necessary. EAT LOTS OF APPLES, pregnant or not! They’ll be mushy and wrinkly and waxed and imported soon. This apple from the Pacific Northwest is the result of a cross between a Gold Delicious and a Cox Orange Pippin. 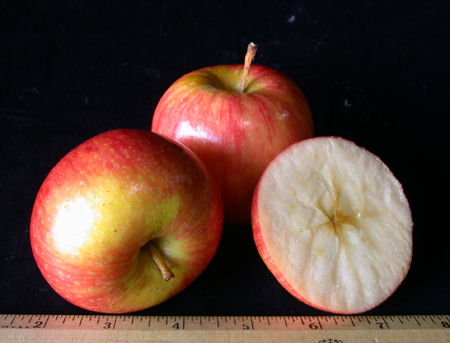 The Pinata Apple won “Apple of the Year 2004” honors in Europe. Its flavor is very sweet and it has a soft texture. Wonderful for cooking or eating out of hand! Available through May or until the grower sells out.